I'm thrilled to announce my first publishing credit in crime fiction! 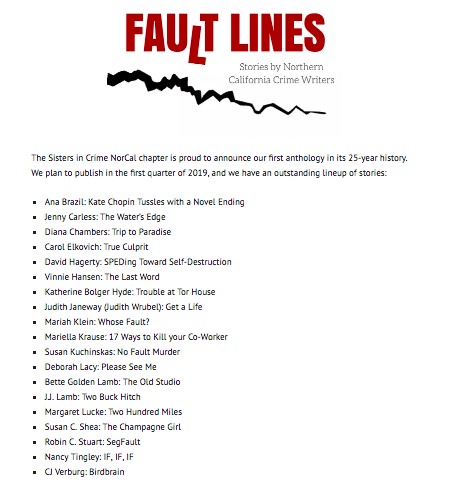 It's sort of a double debut - my local chapter of Sisters In Crime is publishing their first-ever anthology, Fault Lines: Stories by Northern California Crime Writers, coming in March 2019. I wrote the short story, "SegFault," (geek shorthand for "segmentation fault," a computer error condition) to see how far I could make it in a blind submission process alongside the award winners and best sellers in the NorCal SinC chapter. It also gave me a fun way to challenge myself to write a cyber crime-themed short story, as opposed to the novel I'm currently polishing up. The word count restriction tested my ability to translate technical concepts into plain English while spinning a compelling yarn. Watch this space for updates as the release for Fault Lines date draws nearer. 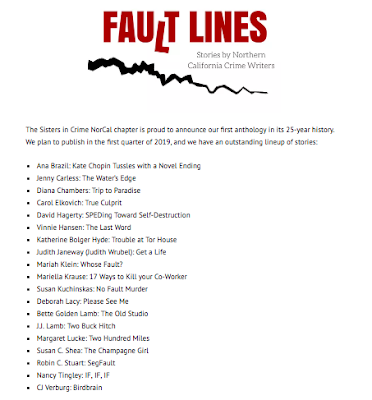 Robin C. Stuart is a veteran cyber crime investigator and contributing author to the NorCal Sisters in Crime short story anthology, Fault Lines, coming March 2019. Her non-fiction work includes contributing to Handbook for Information Security (John Wiley & Sons, 2006). She consults on all things cyber security for Fortune 100 companies, screenwriters, media outlets including BBC and NowThis News, and appears on panels at writers’ conferences including Left Coast Crime and Book Passage Mystery Writers Conference. Robin was a significant contributor to the Tech Museum of Innovation’s acclaimed Cyber Detectives interactive installation, one of the museum’s most popular permanent exhibits, which earned praise from the Obama Administration. She lives in the San Francisco Bay Area. Represented by Paula Munier at Talcott Notch Literary. All words & pictures on this site belong to me unless expressly stated otherwise.. Picture Window theme. Powered by Blogger.